A new BlackBerry-branded smartphone is coming to "select markets" across the world, but if it feels familiar, that's probably because it's not an entirely new device. Originally unveiled last summer, the BlackBerry KEY2 is not ready for a sequel just yet, simply getting an "all-new" version at MWC 2019 with a snazzy coat of paint splashed around its hybrid design and more storage. Remember the Black Edition of 2017's KEYone? This is... obviously nothing like that, aiming to capture the attention of business and security addicts that may want to stand out during their travels and private web browsing sessions with an arguably swanky but certainly not distasteful handset design. We're not sure that's much of an audience, to be honest, but perhaps BlackBerry can entice today's teens to give physical keyboards a chance for their texting and social networking needs. It's important to point out the BlackBerry KEY2 Red Edition doesn't actually come with fiery red keys, maintaining classic black accents for that and the phone's smoothly textured back. The snazzy new color is merely found on the robust Series 7 aluminum frame, wrapping around the 4.5-inch touchscreen and capacitive touch 4-row, 35-key BlackBerry keyboard with a fingerprint sensor integrated into the spacebar. The side-mounted volume rocker, power button, and the so-called Convenience Key are also black, which adds a certain flair to a stylish handset that could have easily slipped into a territory of poor taste and extreme flashiness. Described as "one of the most unique smartphones available today", the BlackBerry KEY2 Red Edition is already up for pre-order in Europe in exchange for €779 or £699. While a US launch isn't explicitly confirmed just yet, the fact we have a USD price is definitely an encouraging sign. 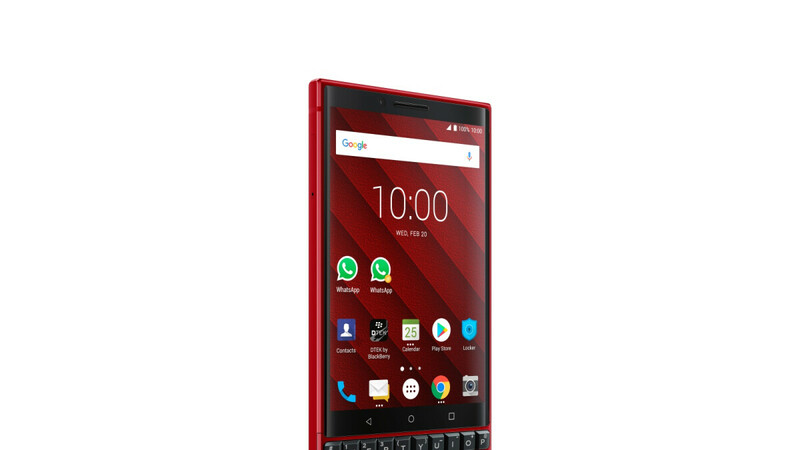 At $749, this "limited edition" device is around 100 bucks costlier than a regular KEY2 in an all-black color, bumping up the internal storage space from 64 to 128 gigs while keeping all other specifications in place. We're talking a 1620 x 1080 display, Snapdragon 660 processing power, 6GB RAM, dual 12MP rear-facing cameras, a single 8MP selfie shooter, and a generous 3,500 mAh battery. No words on whether or not the KEY2 Red Edition runs Android 9.0 Pie out the box, so we're guessing it does not and you get an outdated Oreo software flavor instead. Reminds me of the red Passport. Lookin' good TCL.